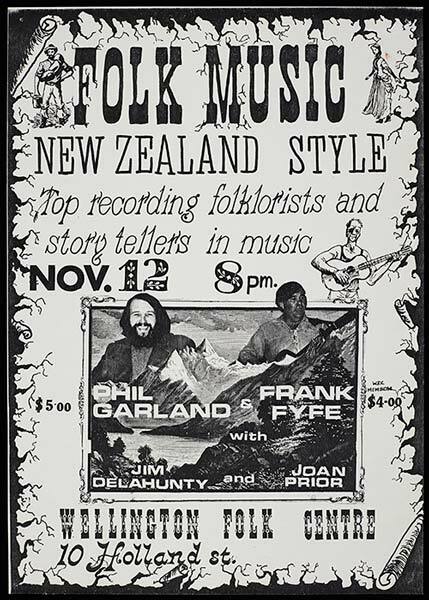 This 1980 poster from the Wellington Folk Club advertises a concert featuring Phil Garland and Frank Fyfe. In the 1960s Frank and Mary Fyfe ran the Balladeer Cafe, a major site for Wellington's folk revival movement. Frank Fyfe set up the New Zealand Folklore Society in 1966. Phil Garland was a dedicated collector of folk songs and composed his own songs in a folk style. Joan Prior had been involved in the Wellington folk-music scene since the 1950s, while Jim Delahunty, well known as a left-wing activist, was also a prominent folk-song collector and composer.